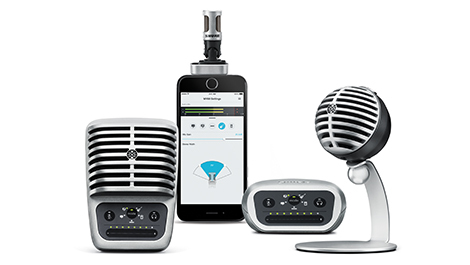 Shure is introducing the MOTIV™ range of digital products, a new plug-and-play microphone line aimed at individuals looking to capture high-quality, 24-bit 48 kHz audio via a Mac, PC or Apple iOS device for podcasts, YouTube videos, field recording, or to capture acoustic/vocal performances. All four members of the new MOTIV range are Apple MFi (made for iPhone, iPod, or iPad) certified devices, including three condenser models (the MV5, MV88 stereo model, and MV51 large-diaphragm model) and a sleek digital audio interface (MVi) that can connect directly to any iOS device without additional adapters or connection kits. For in-depth control, there's also the free ShurePlus™ MOTIV Mobile Recording iOS app. • MV5 Digital Condenser Microphone: The MV5 is ideal for recording vocals and acoustic instruments, or for use with Skype, and comes equipped with three DSP modes, Micro-B to USB and Micro-B to Lightning cables. Engineered for quick and easy portable use, the MOTIV MV5 has a custom tuned microphone capsule and a built-in headphone output for real-time monitoring. It's available in grey and black and ships complete with a detachable desktop stand and integrated thread mount compatible with any quarter-inch standard camera tripod. The MOTIV product line will be available in autumn 2015.